Presbyterians in Ireland - So many Oaths to take. Presbyterians were in Ireland before the Plantation period and, moreover, were in the south. The Rev Walter Travers, first Provost of Trinity College, Dublin was a Presbyterian minister as was his successor, the Rev. Henry Alvey who became the first Vice Chancellor. James Hamilton, later Lord Claneboye, was one of the first elected Fellows of the University along with James Fullerton. Thus there was a group of Presbyterians in places of power and influence from Elizabethan times. Although the Presbyterian Covenanters were essentially Scottish and were bloodily persecuted in the later years of the 17th century, their Presbyterian brethren who migrated to Ireland were also subjected to persecution by those in authority and suffered their own " Killing Time " With hindsight it is quite remarkable just how many times successive governments cynically sought to use an Oath as a device for coercing the Presbyterians, surely knowing that it would be rejected on grounds of conscience and thereby give them the excuse to resort to force. The Montgomery Manuscripts mentions that " Sir Hugh Montgomery brought with him from Scotland two or three chaplains " It was the settlers who came to Co Antrim and Co Down ca 1606 which gave cause for the ministry. These settlers were mainly from Ayrshire and would have sought a pastor of their choosing at an early date. The Hamilton Manuscripts record that the Viscount Claneboy settled ministers in all six Parishes within his estates. The first full time minister was Edward Brice who came to Broadisland in 1613 having been forced to flee persecution (and it is alleged, a charge of adultery) in Scotland. Bearing in mind that one of the main objection of the Presbyterians was the rule of the Bishops, their early years in Ulster enjoyed the benign influence of Archbishop James Ussher who produced his Articles of Religion in 1615. 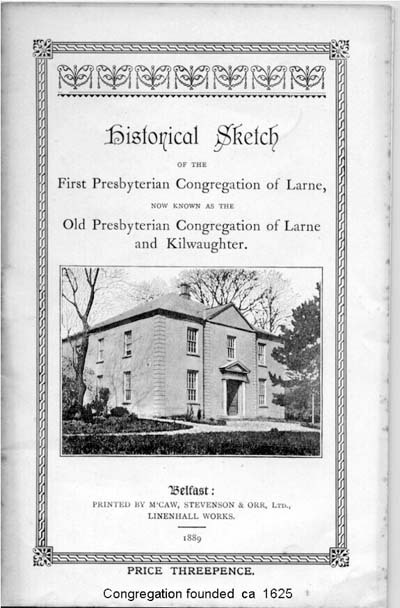 The importance of Ussher`s contribution to the founding of Presbyterianism in Ireland is sometimes understated and undervalued. But there can be little doubt that his influence in the early days of the Plantation was critical because it fostered the first ministers and encouraged them to settle in the land. Ussher had been brought up and educated under Presbyterian influence and was not laden with sectarian bigotry. His Articles of Religion were evangelical and moderate with a distinctly Calvinist theology and, moreover, made no mention of the three orders of bishops, priests and deacons. The need for Episcopal ordination was ignored and thus by implication accepted the validity of ordination by presbyters. They disclaimed the observance of Lent as a religious fast and claimed no authority for decreeing the rites and ceremonies of the church. This set of ground rules allowed the Presbyterians to conduct their worship, receive the church tithes and to coexist with the established Anglican form of the Church of Ireland created in 1560 by The Act of Union. 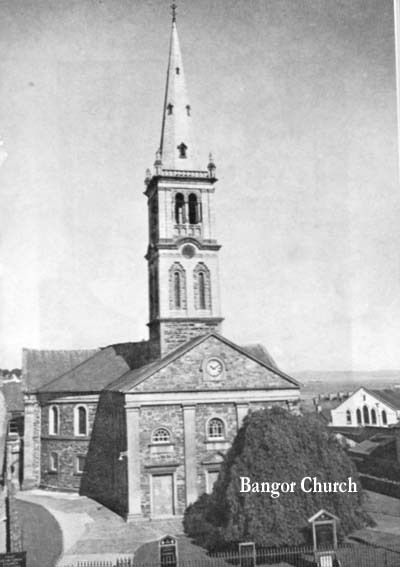 Soon Edward Brice was joined by Robert Cunningham at Holywood (1615) ; John Ridge, an English dissenter, at Antrim (1619); Josias Welsh, the grandson of John Knox, at Templepatrick ; a Rev John Hubbard from Southwark, London , who brought his congregation with him to Carrickfergus (1621) ; James Glendinning who replaced Hubbard at Carrickfergus (1623); Robert Blair at Bangor ( 1623 ) ; George Dunbar a former minister at Ayr and prisoner in Blackness Castle settled in Larne (1625); James Hamilton, nephew of Lord Claneboye, at Ballywalter (1625); Andrew Stewart at Donegore (1627) and John Livingston at Kilinchy (1630). Some of these ministers accepted Church of Ireland livings although Blair, Welsh and Livingston ministered for many years in the Presbyterian form and without an organised Presbytery. The Six Mile Water revival sits alongside that of the `Stewarton Sickness` and the `Shotts Revival` as an event in which a great passion was raised, and a lasting religious awakening that came to the people of Antrim. The valley of the Six Mile water runs from Larne, the river rising about four miles south west of Larne and passes through Ballynure, Ballyclare, Doagh, Templepatrick and Antrim into Lough Neagh. Once called the `Ollar` it was known as the `Owen-na-view` or `the river of rushes` in the sixteenth century. The Six Mile Water name is believed to have come from the fact that an old fording point across the river was about six miles distant from the towns of Antrim and Carrickfergus. The Rev James Glendinning had come to Ulster ca 1622 and was at the very heart of the Six Mile Water Revival in 1625. He was the incumbent of Carnmoney and a lecturer at Carrickfergus which was the centre of the English presence at that time. The Rev. Robert Blair heard Glendinning preach and concluded that he was doing so by rote, with no real fire, to a basically English congregation. Blair convinced Glendinning to remove himself to Oldstone (Muckamore) where he would be among his own Scots, who appreciated an evangelical style and a fire and brimstone approach. At Oldstone the Rev James underwent transformation and became a very powerful preacher with some alarms being raised at the ecstasies and enthusiasms“ which were generated in the congregations. There were instances of people swooning and of “high breathing and panting” (hyper ventilating) which concerned Blair and his fellow ministers who saw the danger of hysterical outbursts and emotionalism drawing the attention of the government and episcopalian supporters. Glendinning could not, however, apply the Gospel to the sin laden populace and the other ministers, especially Josias Welsh, came to his aid with very satisfactory results. The Reverends Blair, Ridge, Cunningham and Hamilton joined in the revival that swept the river valley of the Six Mile Water. Glendinning left the district in 1630, an ill man intending to visit the seven churches of Asia.